Indulge your lips in the best-selling Yves Saint Laurent Tatouage Couture Matte Lip Stain, a long-lasting liquid lipstick that applies like a stain. Tatouage Couture is the ultimate lip stain for those that want their lipstick to last. 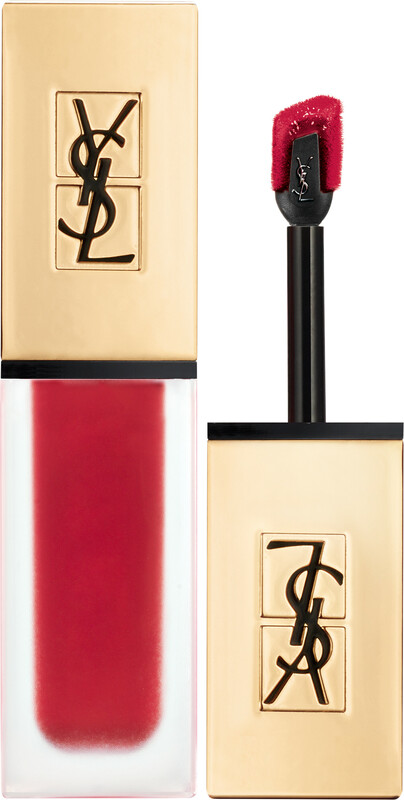 Transfer-free and quick-drying, its voluptuous ultra-matte finish feels weightless on the lips. Ideal for matte liquid lipstick lovers, this long-lasting stain glides onto your lips, providing 8 hours of high impact wear without the need to constantly re-apply. The breakthrough Tatouage Couture formula feels like you’re wearing nothing at all. Its high pigment concentration forms a thin veil of colour never before seen – or felt - in a liquid lipstick formula. In addition to not having to worry about top-ups, what we really love about the Tatouage Couture Lip Stain its ink-like formula and patented bevelled applicator. What’s so special about this applicator? Its ability to shape the most uneven lips; the angle of the brush makes it so easy to apply and layer – it’s a must have! As the applicator and lightweight formula makes applying the colour so easy, we recommend that you use the pointed edge as you would a lip liner to define the edges, then fill in your lips with the widest side of the lip marker for a full finish.